A key principle in the scientific classification of animals, plants, and other living things is that the system of scientific names reflects their relationships. This is because there is only a single evolutionary history, and it provides an objective basis by which to name life. As we learn more about these evolutionary relationships, scientific names are often revised accordingly. Blechnaceae ferns are common in several parts of the world. 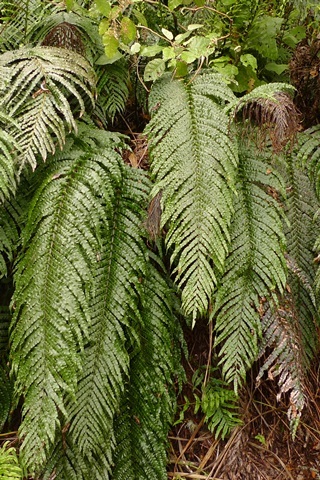 For instance, all New Zealanders will be familiar with kiokio and its relatives in the genus Blechnum, colloquially known as “hard ferns” because of their tough-to-the-touch fronds. Kiokio (Blechnum novae-zelandiae) is a common sight on road cuttings, amongst other habitats, and occurs throughout the country. Photo Leon Perrie. © Te Papa. 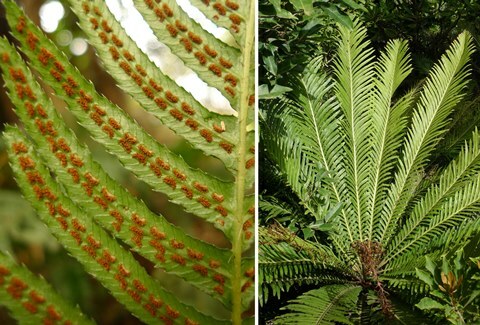 Along with colleagues at Te Papa and The University of Melbourne, I’ve just published a scientific paper examining the relationships of the world’s Blechnaceae ferns, of which there are about 200 different species. We’ve clarified many of the relationships within this family. As a result, we recommended several name changes: we moved species that were placed in the genera Doodia and Pteridoblechnum into Blechnum, and we placed a couple of species that were in Blechnum into a new genus we’ve called Telmatoblechnum. Abstract of our paper in the journal Taxon. Webpage of our colleagues at The University of Melbourne. Ruby Wilson deserves special mention; Ruby generated the Australian data as part of her BSc(Hon.). Using analyses of DNA sequences to infer relationships, we found that both Doodia and Pteridoblechnum are nested within the family tree of Blechnum. Put another way, some Blechnum species are more closely related to the group of Doodia species than they are to other Blechnum species; and other Blechnum species are more closely related to the Pteridoblechnum species than they are to the remainder of Blechnum. 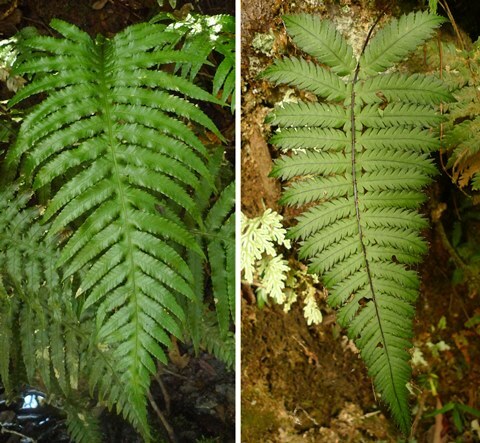 Left: rasp fern, Blechnum parrisiae, previously called Doodia australis, occurs in both Australia and New Zealand. Right: Blechnum gibbum, from New Caledonia. Blechnum gibbum is more closely related to the species formerly placed in Doodia than it is to most species of Blechnum. Photos Leon Perrie. Composite © Te Papa. The genus Doodia contained 15-20 species, mostly in Australasia but also reaching Asia and through the Pacific to Hawaii. They are colloquially known as “rasp ferns”, presumably because many species have serrations on the margins of their fronds. They had been distinguished because their spore-producing structures occur in short lines rather than in a pair of continuous lines either side of the mid-vein. The only common species in New Zealand is what was known as Doodia australis, which is abundant in the northern North Island, but only sparse in the southern North Island and northern South Island. The name in Blechnum for this species is Blechnum parrisiae, honouring New Zealand fern expert Barbara Parris. Left: Blechnum neglectum, previously Pteridoblechnum neglectum, found only in north-eastern Australia. Right: Blechnum diversifolium, from New Caledonia. Blechnum diversifolium is more closely related to the species previously placed in Pteridoblechnum than it is to most species of Blechnum. Photos Leon Perrie. Composite © Te Papa. 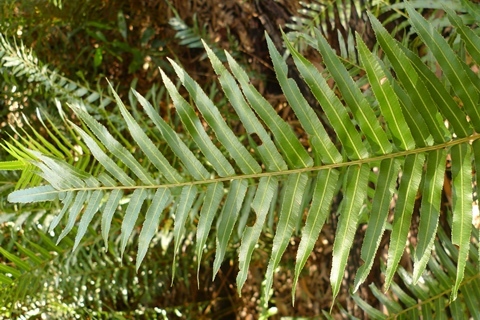 The genus Pteridoblechnum contained two species, both found only in north-eastern Australia. These species are unusual in having anastomosing (rather than divergent) veins. Our results indicate they are related to other species also unusual in the Blechnaceae in having twice-divided fronds which have nevertheless traditionally been treated in Blechnum, including Blechnum fraseri which occurs in New Zealand. Many people interested in the classification of life dislike such incongruity with relationships. They believe formally-recognised groups of species should comprise only species that are more closely related to one another than they are to species from other such groups. The jargon for these preferred groups is “monophyletic”, compared to “paraphyletic” or “polyphyletic”. There are two principal ways to revolve such incongruity between relationships and the classification: (1) we could split Blechnum into multiple groups, until each group only contained species that were more closely related to one another than they were to species from other groups; or (2) we could transfer the species from Doodia and Pteridoblechnum to Blechnum. We opted for the latter option because it involved the fewest name changes. 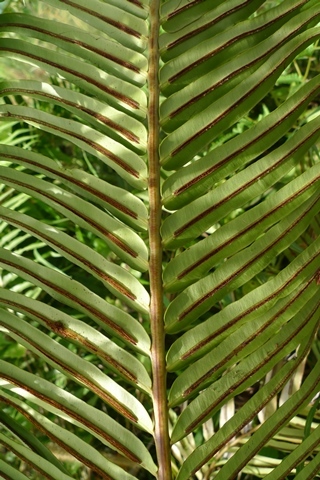 Blechnum orientale, in Fiji. Most species of Blechnum in New Zealand are “dimorphic”, with obviously different fertile and sterile fronds. (The only exception in New Zealand is Blechnum fraseri, which is only partially dimorphic.) However, many overseas Blechnum are “monomorphic” like Blechnum orientale, which is widespread in the tropics from Asia through Australia to the Pacific. Photo Leon Perrie. (c) Te Papa. New Zealanders familiar with their species of Blechnum may be surprised by the close relationship with the species that were in Doodia. In part, that may be because, although New Zealand is home to 22 species of Blechnaceae, they belong to a comparatively limited set of the world’s lineages, providing only a restricted appreciation of the morphological diversity of Blechnaceae. Telmatoblechnum indicum, near Brisbane (Australia), previously Blechnum indicum. Photo Leon Perrie. © Te Papa. We also recognised a new genus: Telmatoblechnum. This is because we found that two species traditionally placed in Blechnum (as Blechnum indicum and Blechnum serrulatum) are actually more closely related to other genera in the Blechnaceae (namely Stenochlaena and Salpichlaena). Telmatoblechnum indicum is from south-east Asia, Australia, and the western Pacific, and Telmatoblechnum serrulatum is from tropical America. Both species often occur in swamps; with “Telmat-” Greek for wet ground. Doodia australis (Parris) Parris Blechnum parrisiae Christenh. Doodia mollis Parris Blechnum molle (Parris) Christenh. Doodia squarrosa Colenso Blechnum zeelandicum Christenh. * Doodia aspera R.Br. has been recognised in New Zealand, but no definite populations are known. It is otherwise an Australian species. Its name in Blechnum is Blechnum neohollandicum Christenh. Details of Te Papa’s collection of Blechnaceae ferns. While changes to scientific names can be frustrating, they are (or should be) a reflection of new knowledge. Since we’re a long way from knowing everything, more change is guaranteed. But perhaps there is solace that this remains an exciting time of new discovery and that there is an end-goal. I am surprised that so many Blechnums are ‘monomorphic”, as I had always assumed ‘dimorphism’ (separate fertile and sterile fronds) to be the core distinguishing feature of Blechnums. Do the dimorphic Blechnums represent a subgenus, or is this a trait that has arisen independently in several different phylogenetic lineages? Yes, it surprised me too once I started looking into it. Monomorphism and dimorphism are spread throughout the family tree, so there appears to have been several independent transitions (but mono to di, and/or di to mono?). Congratulations on publishing this important paper! It is a huge contribution. I am particularly interested to see the relationship of Telmatoblechnum to the rest of the family.